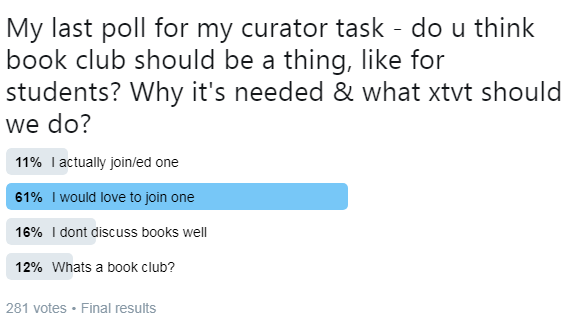 I know, that curator thing had passed like a million years ago but I have put this as list-of-topics-i-will-blog-about so I just have to still do this. I hope you guys can benefit from this. These are merely my curiosity. You see, I'm not really a reader and the first time that the idea of reading lots of books come to my knowledge is when we were in high school. Everyone reads those cheesy love novels by Alaf 21 and for me, that's no reading. Upon entering university I learned that there are actually plenty of books to be read and even though it is exciting I learned another new thing also - I don't really enjoy all books. Yet, even so-called "universities student" we didn't really spend much time reading. We watched lots of movies though. Books are wonderful. A lot of exciting new things and adventure. An escape. An answer. A whole new world. From there on I try to keep challenging myself to read or at least find more books that I think I will like. Wattpad and fan fiction has been wonders as well. Excuse me, sir, what you're doing with your lips is so unnecessary. Anyway, due to this newfound love and of course, because I'm unemployed, I applied for curatorship at @twt_buku. I didn't think I'll get it since I saw some butthurt tweets questioning why their application wasn't successful when @twt_buku didn't have any curator for monthsss. 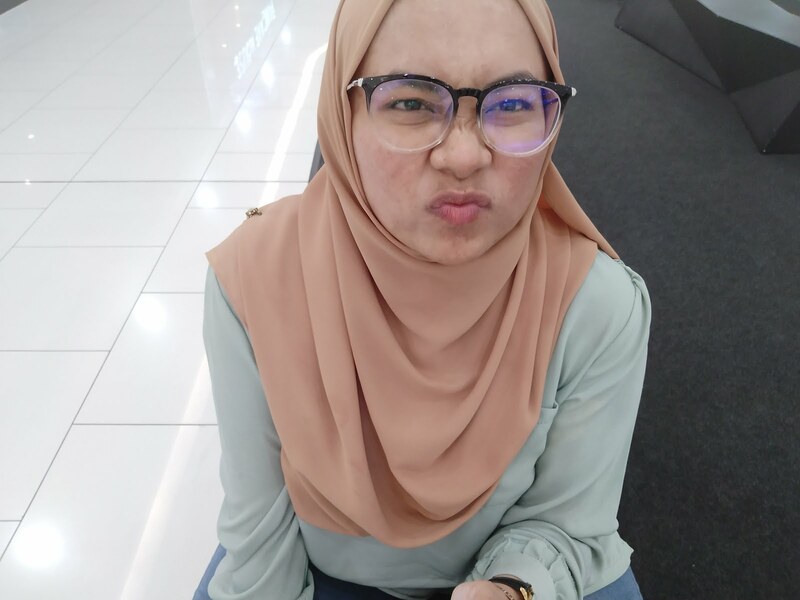 Rezeki I guess. From these background history, I got an idea to learn more about Malaysian reading habits and how to instil reading habits. Actually, to read more tips on how to make reading a habit just use the #howtomakereadingahabit hashtag on Twitter. 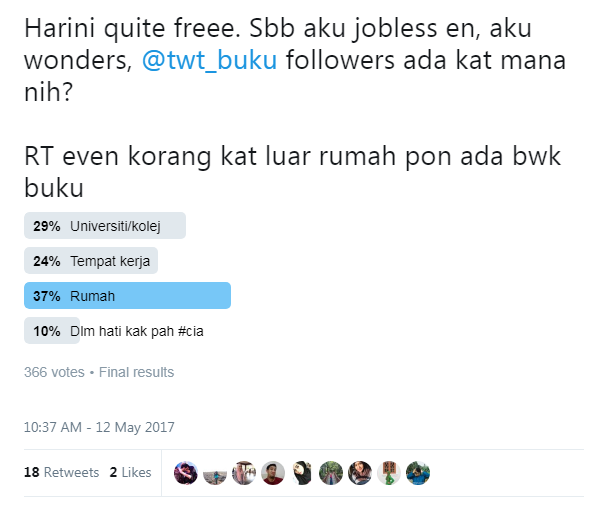 The @twt_buku followers got some pretty exciting tips. Omg, you guys must have gotten sick of all the polls I have posted so far. Please bear with me guys. Anyway, to read this on Twitter just click this link HERE. So I guess among those 366 peoples, only 18 brings a book everywhere. use that #kakpahreads hashtag and learn how to become an avid reader. 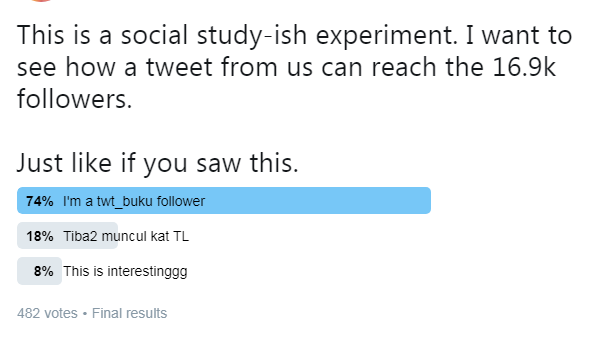 Kinda want to see if @twt_buku account brings a strong impact. Final word - don't forget to vote on my mini research about "Understanding Malaysian Bloggers Behaviour (Part One)"
I have never heard of Danielle Steel. Oh my, still lots to learn. 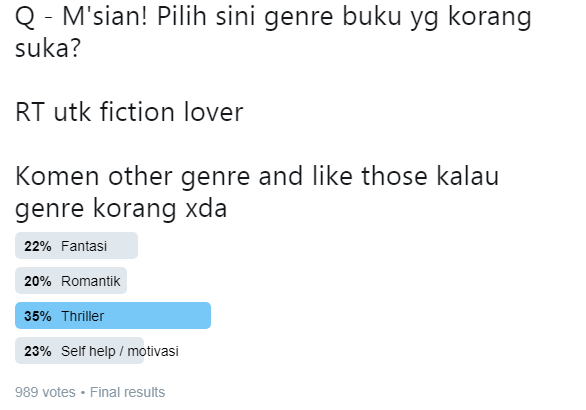 I guess one of the reason thriller type of books win is because fixi? Lol. 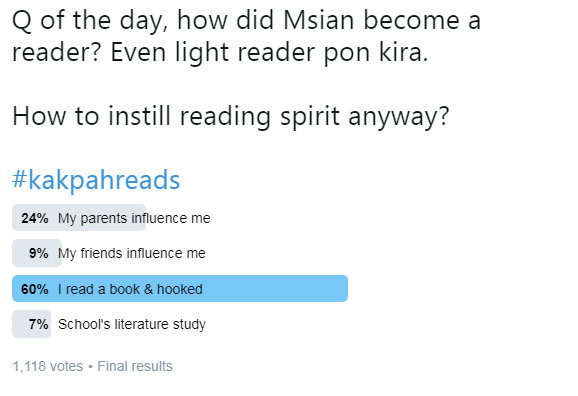 One of the things that I realized during my secondary school is that more guys actually start to read because of Fixi - and its actually fascinates me ._. Well, I think you're right. I don't think the guys that I know read though lol. I don't really like to read at home. I usually feel motivate to read outdoor. In the train, in the car or sitting in the park. Feels much better. Bookclub is actually a thing but they are mostly done in small group. Singledust joined one and usually have their book review session at KL Sentral. How exciting to get to talk about a book you love. I was the opposite though. I love to have a good peaceful atmosphere for me to read or else I'll be easily distracted. I am retired and have all the time for reading but i don't. The last novel i read was Sidney Sheldon's Master Of The Game and the last biography type of reading was Leap Of Faith by Queen Noor. You can say those were ancients ha ha. Those days books were expensive even paperbacks. I don't know how is it now. I never heard of those lol. It was quite expensive until now too. But it really depends on the kind of books and publishers. Most Malaysia's indie publishers sell it cheaper, to survive the competition I guess. But they do have interesting plots so maybe you can try that.